Estée Lauder continues to distract from the meaningful action needed to address and end the breast cancer epidemic by distributing pink ribbons at cosmetic counters, selling a variety of pink ribbon products, and staging publicity stunts, like illuminating international landmarks “for awareness.” The corporation tells women to “choose happy,” “laugh often,” and “smile,” as if all it takes to defeat cancer is a positive, pretty attitude. And on top of all that, Estée Lauder still uses chemicals in their products that are suspected to increase the risk of breast cancer and may even interfere with treatment. We can make a real difference. Send your email to the CEO and the Executive Chairman of Estée Lauder today! P.S. 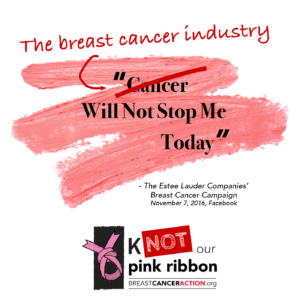 After you tell Estée Lauder to stop the betrayal, share our “Knot Our Pink Ribbon” campaign on Facebook and Twitter to help spread the word and encourage your friends and family to join you in taking action!